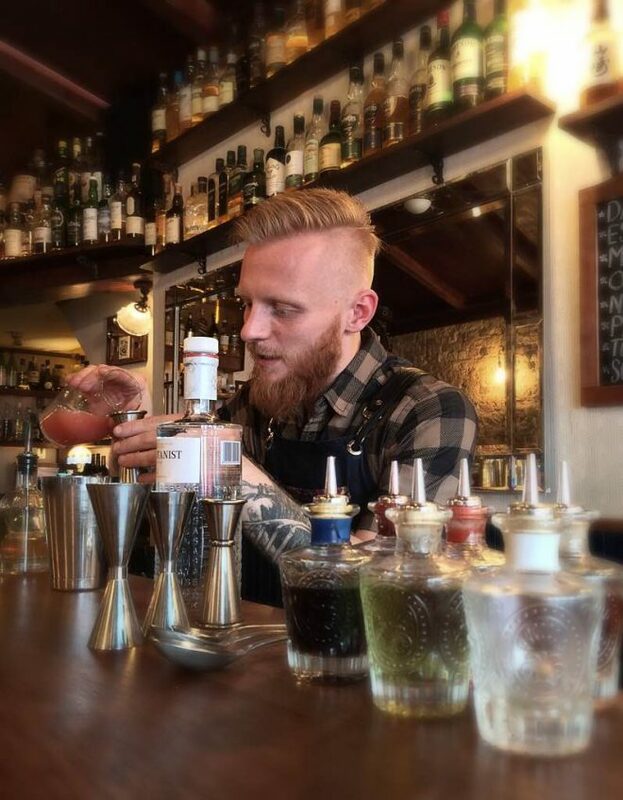 My name is Bart, I’m from Poland and I’ve been bartending for four years now. Before I got into this, I was a fashion photographer in Poland, London and New York, but it was very tough and I got burnt out. I just didn’t want to do it anymore and one day when I was in a bar I saw all these happy people and thought maybe this is it… this is my happy place. So, I started as a glass collector at a club in Warsaw and eventually I started waiting the tables there and finally they let me get behind the bar. The three guys that ran that bar influenced me in their own ways and shaped the way I work today. As Steve Schneider once said at the London Sessions “a perfect bartender is equal parts rockstar, sage and mixologist” and each of those bartenders had one of those qualities. After working as a barback, then a barman the owners opened a new bar and I was made Principal Bartender, then Bar Manager. I moved to London over a year ago and am incredibly happy to be working at High Water… a bar where we want our customers to leave their problems at the door and have a great time. I would say in this bar I am the First Officer and Barbaros is the Captain, he is such an amazing mentor and I learn so much from him everyday, as a bartender and as a host. My fiancé, Monica and I take notes all the time, as we want to open a bar together. We’d like a small space, with a speakeasy vibe (but not in a basement) with a rustic interior, brick walls and loads of wood. We’d have apprentices working there too, so everyone learns and grows and it becomes a tight-knit team. We’d also have a small kitchen, so we could offer customers small bites. Also from time to time have live music, like jazz or blues bands playing. We have still not decided on a location, but we know it would be in a city. When we go out we like to explore new cocktail and wine bars for inspiration. If we want to go to our favourite places we really love Callooh Callay, Happiness Forgets, Original Sin, Victory Mansions, Sager and Wilde and Le Beaujolais. I also do carpentry to relax and I actually just finished making a wine rack. I’m a gin geek, I’ve always loved gin. There are so many wonderful products to choose from and in my opinion it’s a great spirit to use in cocktails with so many interesting botanicals. At the moment my favourite is Burleighs Distillers Cut Gin, it’s very earthy and probably the best Negroni I’ve ever had was made with this particular gin. A good cocktail is essentially what the customer likes. That’s it. I personally love drinks that make you discover them. There is a start, a middle and an end. And they should not have more than five ingredients. I like challenges, so I would have to say Fernet Branca Menta. It’s so strong and you need to work really hard to find things that work with it, so it does not overpower them. I also love seasonal products and currently am working a lot with flowers, especially lavender. If you haven’t spoken to Marcis at Sager and Wilde in Paradise Row, you must go. His understanding of flavours is immense and his knowledge is endless. Also the guys at Victory Mansions which is just up the road. My final choice would be Peg and Patriot, you definitely need to speak to Constanca. They’re on a totally different level… it’s chemistry.